1. Assemble the lasagna, which I’ve done before with regular lasagnas, but the sauce for this one wasn’t very wet and since I prefer to use the no-boil noodles, we added more salsa. Come Monday night it was very flavorful in a way that is completely different then what one expects from lasagna, but no complaints here! We garnished with sour cream and hot sauce, per our preferences. 2. 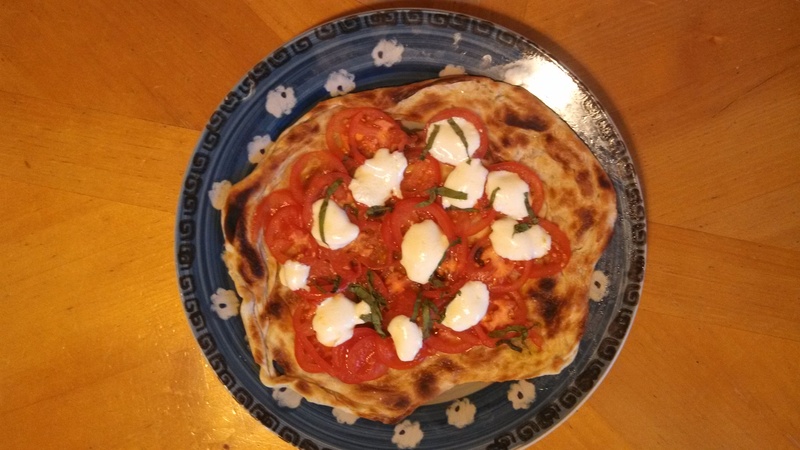 We had found this recipe http://www.bonappetit.com/recipe/flaky-bread in a magazine we borrowed from the library and were anxious to try it, then I had the idea to turn them into pizza margaritas (one of our favorites). 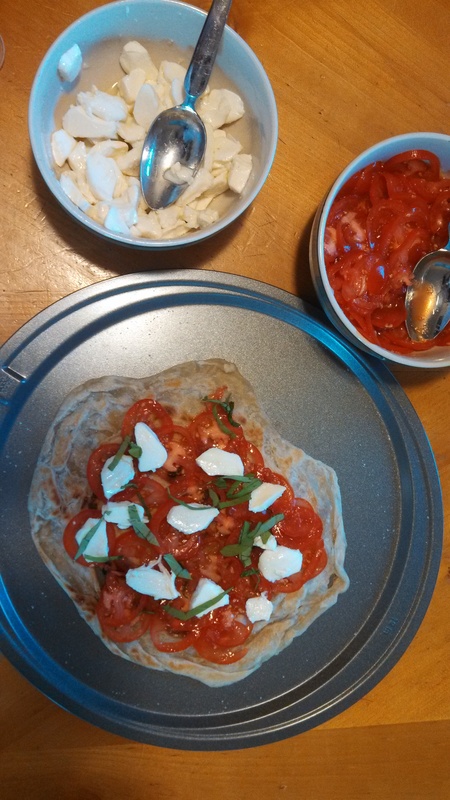 We had some tomatoes he’d gotten earlier in the week and fresh mozzarella balls too, perfect. 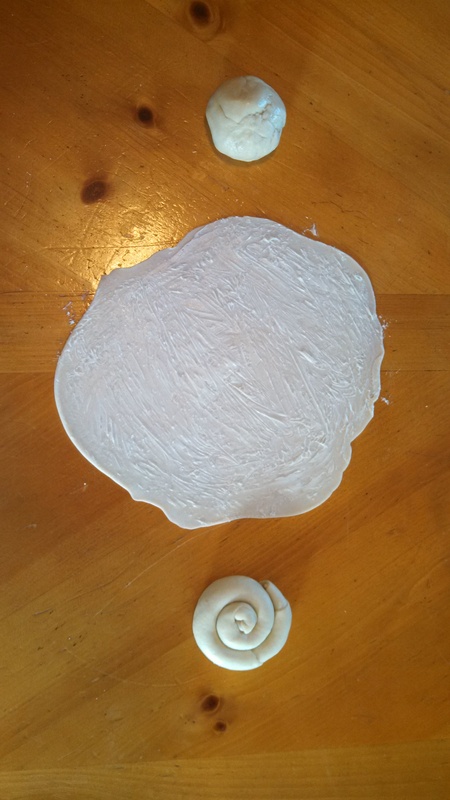 It was quite the process, the dough came together just fine, and after I let it sit for the four hours the recipe calls for, it was very, very soft. I was surprised by how long it took to roll them out. After dividing them (I weighed them to keep them even, 2.25 oz. each), I rolled them into balls and let them sit. Once they were done resting, I got rolling, it took well over an hour, but there were lots of layers in there. At the top is the ball post-rest, then rolled out in the center, and coiled at the bottom. I found them to be hard to manage after rolling them out a second time, they’re so thin! But I managed to butter them and fry them up, one at a time. After they came out, he salted them and set about turning them into pizza. It had to be eaten soon after it finished, or the crust went soggy, so it was more of an eat while you cook” then a sit down meal, but it was so good that we didn’t mind. In fact, we couldn’t make it fast enough and found ourselves impatient for the next one to cool off. 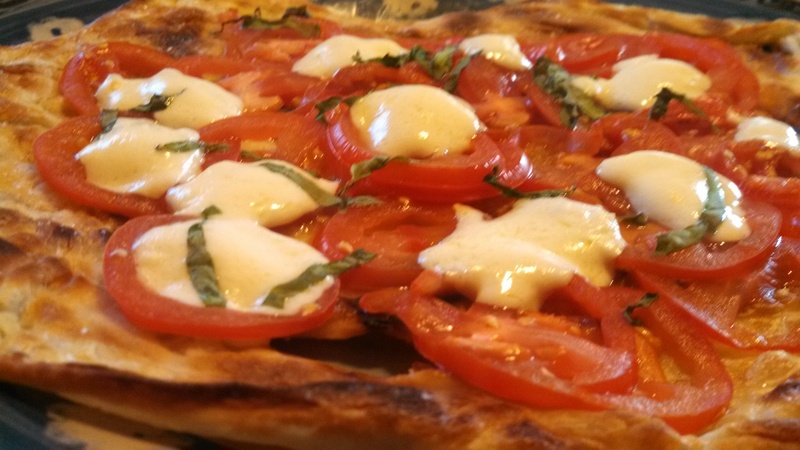 It was a wonderful pizza, we ate and ate and it never felt heavy in our stomachs. The bread just plain was also good, and flaky, just like it claimed. One thing I found interesting was that the darker spots (a.k.a. the nearly burned ones) had an even richer flavor, as opposed to getting that dark, burned flavor most other things do. We shall definitely revisit it and explore its potential. It was hours later when we finally finished (the rolling alone took more than one), but we couldn’t have been happier. Another case of hours of labor resulting in amazing results which makes it all worth it. 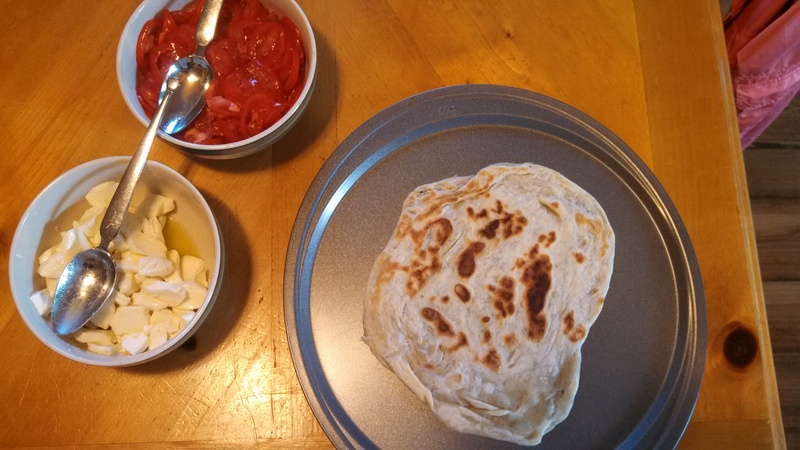 This entry was posted in Bread, Pizza and tagged Firsts. Bookmark the permalink.